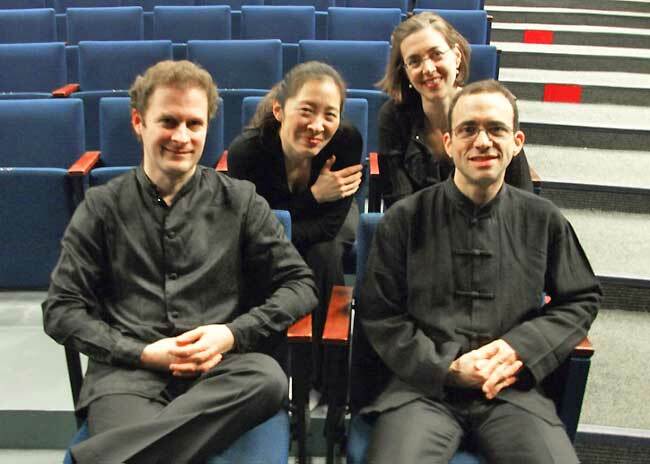 The Brentano String Quartet, founded in 1992, performs throughout the world, garnering prizes and prestigious positions wherever they go. They are currently the resident quartet at Princeton University. So it was with some anticipation that we heard their concert at Concord Academy last Sunday, as part of the Concord Chamber Music series. They did not disappoint. They chose to present three works by youthful composers whose names began with “B”: Beethoven, Busoni, and Bartók. Beethoven’s Quartet in F major Op. 18, No. 1, probably the second string quartet he composed, is a spectacular showpiece. The Brentano’s performance was notable for its clarity of ensemble and balance between the players. There was fire where there needed to be, but no one was grand-standing. According to his friend Karl Amenda, Beethoven was thinking about the tomb scene from Romeo and Juliet as he was composing the second movement, and the Brentano amply brought out the poignancy of that image. Although Busoni had considerable influence on the music of the early 20th century, one seldom hears his compositions. He composed his second string quartet when he was only 21 years old, in a style reminiscent of Brahms. The quartet was worth hearing, although perhaps not as exciting as the other works on the program. The highlight of the concert was Bartók’s String Quartet N. 1 in A minor, composed at the age of 29. The piece is largely tonal, but the freedom of both counterpoint and harmony foreshadows the composer’s later works. In places the piece was driven by the powerful playing of Nina Lee on cello, but on the whole it was the beauty of the ensemble that made the music so powerfully affecting. The opening lento was particularly lyrical and beautifully played. I cannot resist commenting on the acoustics of the Performing Arts Center at the Concord Academy, where the Concord Chamber Music Society presents their concerts. The hall takes the form of a wide fan, with ~400 comfortable raked seats semi-surrounding the musicians in three sections. There is no stage house – the musicians play from a platform at the center of the semicircles. The surface behind them is covered with an absorbent curtain, and the curved back wall behind the audience is also absorbent. The hall is topped by a high conical roof, which contains both considerable cubic volume and some interesting sound diffusing elements. Fan-shaped halls are considered by most acousticians to be anathema for music, and the idea of putting musicians in front of an absorbing surface is equally frowned upon. But these concerts prove both ideas to be totally incorrect, at least for chamber music in a 400-seat hall. The sound in this hall is marvelous. I measured the reverberation time with the hall occupied, and it varies from about 1.3 seconds at 125Hz to about 1.0 second at 1000Hz and above. These reverberation times are nearly identical to those in Paine Hall at Harvard University, which has a traditional shoe-box shape. But music in Paine is hard and muddled. The sound in Concord is anything but. Music there sparkles with a clarity that draws the listener instantly into the performance. One might expect the hall to sound dead – but it does not. There is a pleasant sense of air around the sound that is lacking in Paine. I sat in three different seats for this concert. For the Beethoven I sat on the far right of the audience, in the last row before the cross-aisle. The sound was wonderful. I could easily distinguish the four instruments with my eyes closed. For the Busoni I moved to the third from the last row of the middle section. The sound was still clear, but I could no longer aurally separate the cello and the viola simply by their position on stage. From this distance they were simply too close together. Fortunately a few people left before the Bartók, and I was able to grab a seat in the center section only six rows from the stage. Wow! What great sound, superior in every way to the sound I heard in the fifth row in Paine Hall when the Chiara last played there. There are good reasons for all of these differences, but they do not belong in this review. Just be prepared to listen carefully and trust your own judgment in picking concert seats. Sometimes traditional wisdom is less than reliable.